Bloomsbury USA Childrens, 9781681194882, 128pp. Maggie's adventures in the Enchanted Forest continue in the third book of a new chapter book series by E. D. Baker! 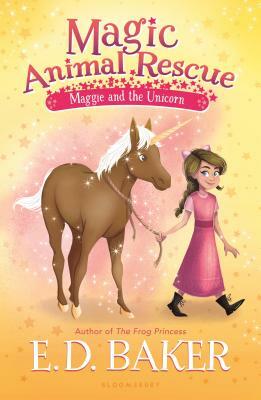 Maggie is loving her new life now that she gets to help her friend, Bob, take care of magical animals at his stable. Not only does she help out in his barn, but she also accompanies him on special trips to help injured animals. When they hear about a hurt unicorn in the forest, Maggie and Bob set off to find and rescue him. But along the way, Maggie's step-brother Peter has his own plans to stop them. Will they reach the unicorn in time?